Since the early days of my age I was involved in the world of Arts. During the Secondary education stage I use to practice the hobby of drawing such as the drafting of Arabic letters in such artistic forms. I used to do this even during the daily lessons of the class. After completing my Secondary education stage I enrolled in the Basic Education College- Education of Arts Section. I began studying the arts " The Molding arts in general", sculpturing, metal, photography, decoration and ornamentation, design of ceramics that was on the most favourate subjects to me. Actually I found myself in clay and to deal with clay and fire, in molding such ceramic forms which were reflecting something from my inside. After being graduated from college where I stood for the 3rd between my colleagues, I worked a schoolteacher where I used to teach the Ceramics subject for the secondary education grade. 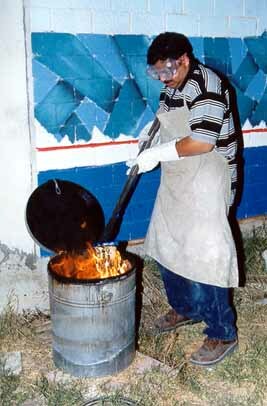 Later I was nominated by the Ministry of Education to participate in a course about the molding of ceramics. I completed this course successfully besides continuous practicing of such ceramic experiments. 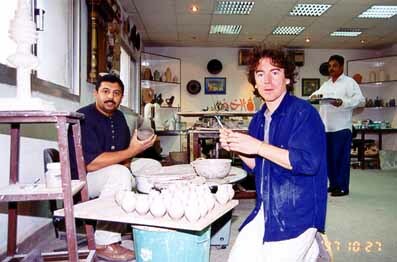 Later I participated in another course arranged by the Ministry about the GLAZES. From this point on, I got the idea of establishing a ceramic section in Kazema Sports Centre where I began training others on ceramic arts. It was the beginning. Later, I began working and experimenting with several types of clay to find out the suitable clay for doing colouring experiments. In the beginning I felt thwarted because of several mistakes and failing experiments. But my admire of adventure side by side with my love of arts and ceramics prompted me to confront myself and continue working to reach and obtain something new in the State of Kuwait and Arab world level first then to think about a step in the international level. My first steps began when I participated in 1994 in the Ceramic Monthly magazine that was my guide to look on new experiments of modern designs. I addition I used to review the questions addressed to the magazines and their respective answers that I gain much benefit. Moreover, I used to follow up all recent global experience and indulge in the development so as to obtain the suitable colour. I do not forget also my personal endeavours to educate myself while following any new books of the art. I do an exhibit in the Arts Society along with my colleague The Artist Jaber Ahmed who is specialized in the Arabic Font drafting. Majority of the critics welcomed the exhibition such as the Kuwaiti Artist Hameed Khazaal who wrote in Al-Anbaa Newspaper that Ali Al-Awadh brought back to us that marvellous Kuwait ceramic art. He solved the equation which many artists tried and still trying to solve, i.e. the coalition between the sculpture as a hardware molded in a beautiful expressing scene and the ceramic the thin in sense and processing so as to come out of this formal subjection of the material. 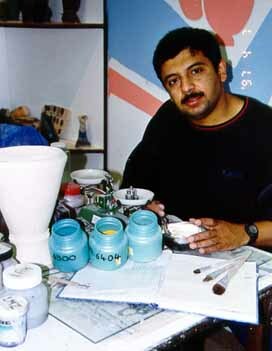 In 1998 I do a workshop jointly with the British Artist "Peter Sebari" in Dexen house. "The house of the first ambassador to Kuwait" The workshop comprised a show reflecting the joint cooperation between Kuwait and Britain in several fields such as arts. The British Artist was exhibiting works made by wheel while I exhibited hand building It was a successful workshop; it contained a variety of molds and style. Later we jointly participated in the show of Japanese RAKU way of work for several works and we made also such experiments in front of public about this Japanese art. 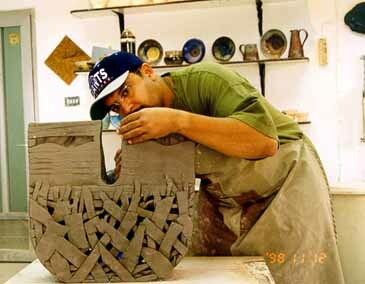 · During my early days in Ceramics I used to practice the manual molding in a simple form as well as the educational style which I learned before and later taught my students on it. My works along with the works of other Kuwaiti artists were nearly similar that if a visitor comes to the show he may not come to differentiate a work from the other but moreover he thinks that one makes all works artistic. · Next I endeavoured to find my different way to each that particular style which can separate me from others. I continued my continuous experiments so as to realize a different recognition. In my endeavours I tried such rocklike touches from those rocks available in the desert of Kuwait. I handled the rock as well as the clay (Earthenware) which was easily formed by hands to reach those touches that I ought to. Then utilizing such feelings of psychological and spiritual emotions to express them through my works such as "Anxiety", fear from the inside, endeavours to reach, Touches. I called addressed these names on some of my works. · Later it came to my thought to form a compound artwork in the beginning it was different, as the kiln was small in size while I used to look for broad and wise works. I tried to do a piece wrought from three pieces, each piece half metre (5. cms) especially for the mold Anxiety. · Anyhow I thought in the idea of using metal or metal pipes with the artistic piece. In the beginning I was afraid of critics rejection for utilizing metal beside clay and ceramics. Anyhow my need to metal lines which I prefer in my practice prompted me to use it where it appeared impossible to do any mold from clay because of easy breakage. · In the last endeavour of making ceramic installations where the piece is made of about 30 small pieces in addition to the creation and basic structure such as "Endeavour to Reach"
· I used always to try using alkaline glazes which is applicable for oxidizing in a step to reach the required strange colour and similar to the metal colour. It makes a similarity between the shape, colour and metal. Regarding the frame there are the rocky touches including some breaking which I mingle with some colouring oxides so as to reach the homogeneity.